As a young teen, I remember visiting my friend and finding her sitting on the floor of her bedroom. The closet was empty. Tracy’s bedroom had the look of a war zone. Boxes, papers, photographs, old CD’s were strewn all over the floor. The shrapnel of her memory was almost overwhelming to her. suddenly something very unexpected tugged at Tracy’s heart. about the mistakes that both her and Dan had made. An emptiness, a sadness seemed to settle into my good friends heart. Searching for something to say to my friend, I noticed in the middle of the floor a little blue box. encouragement that laid within that blue box. It was the promises of God that kept my friend going after her heartbreaking breakup with Dan. the darkest time of her life. What I saw next, was totally unbelievable! a very special blue box. We are very much like my friend Tracy. We try to cling to our past, and the bad memories that haunt us. with God’s help, just move forward! 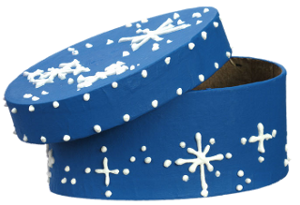 TODAY JUST MAY BE THE DAY FOR YOU TO GET A SPECIAL BLUE BOX! It is happening already – you can see it now!